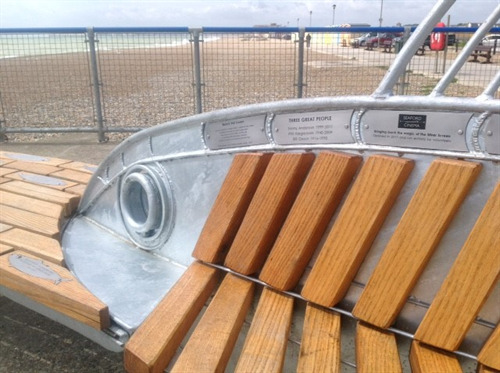 The Shoal, Seaford's Community Bench, is an exciting sculptural seating attraction which has been installed in three stages, the first of which was unveiled on 1 May 2017 by the Lord Lieutenant and Mayor of Seaford amist a buzzing crowd of watchers who turned out to see this fabulous new addition to the beach. The final section was installed in April 2018. 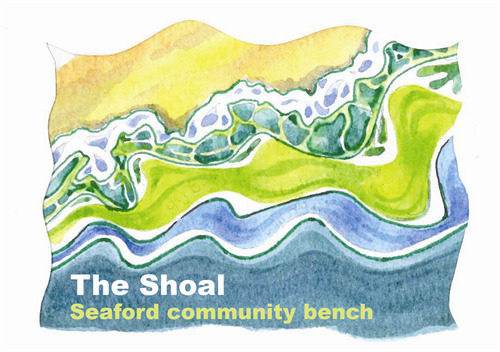 Located on Seaford's widest jetty at Splash Point, close to the beach huts and Seaford Head cliffs, the bench represents a remarkable stream meandering the length of the breakwater. The brainchild of Gabby Tofts, an inspirational gardener, and Christian Funnell, a renowned local sculptor, it is already drawing a lot of enthusiastic attention. Gabby and Christian were selected by the Seaford Community Partnership, working in conjunction with Seaford Town Council and East Sussex County Council, to bring this project to life. Examples of Christian’s work can also be seen in Seaford’s Peace Garden and at Birling Gap. He always endeavours to bring the visitor a sense of engagement with the unique qualities of a given place. 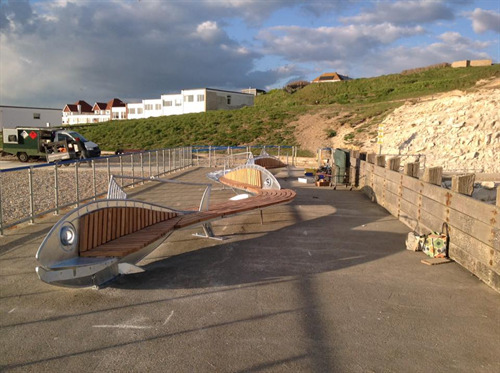 Through generous sponsorship, this stunning sculptural bench has been built to benefit the whole community, becoming a destination with breathtaking views of Seaford Head and Seaford Bay for all to sit a while and enjoy. The galvanised, marine-grade steel used for the sculpture is vandal proof and has a lifespan of 20 years. The following sponsorship options were designed to give a wide choice to everyone who wanted to be part of this amazing project. The success of the project now means that all plaques are now sold out. Swimming through the stream are seven Monumental Mackerel benches, each a unique design and shape, measuring 3.5 metres in length. They face east and west alternatively to capture the views, and each one has space for seven sponsors, representing the ultimate gift to the people of Seaford. 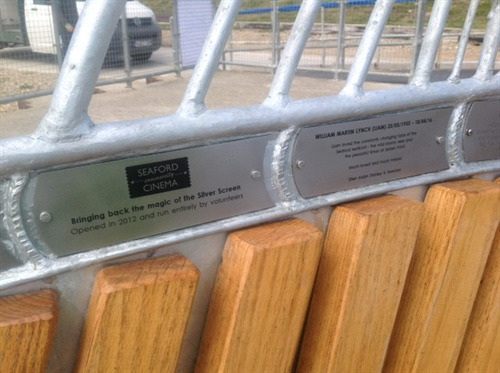 Plaques will be affixed along the top of the Mackerel bench and can include a logo. 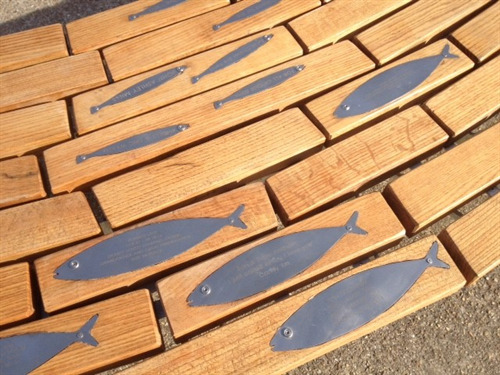 Three sizes of individual fish, made from marine-grade stainless steel, are set in hardwood slats, coming together in a flowing shoal swimming the length of the stream – a celebration of the life of Seaford’s community. 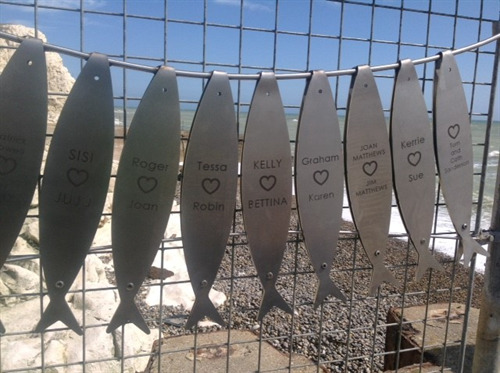 The Sprat can be engraved with your choice of name and makes an ideal gift. A larger fishy plaque to celebrate special events (births, weddings, engagements, special birthdays, retirement) or to remember a loved one. The largest of the plaques gives you freedom to express yourself. 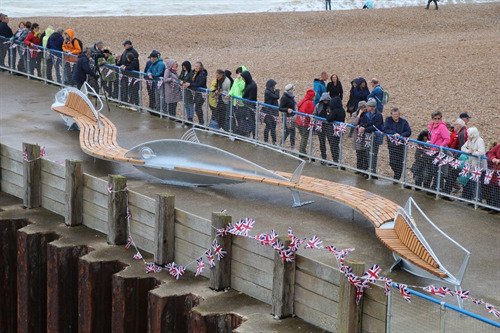 The Herring can again be used for any form of celebration or a memorial dedication. Or how about poetry? Share your favourite verse, inspiring visitors with your love of the sea, cliffs, Seaford and the Downs. For the romantic, the Love Fish are a fantastic engagement/wedding gift or just to say happy anniversary to the one you love. Pairs of stainless steel fish will hang riveted together through a mesh barrier to form a bunting design. The fish are engraved with two names linked by a heart. If you are giving a Love Fish as a gift, a free gift card can be colleceted from the Tourist Information Office at 37 Church Street.